We were so hungry we were ready to eat our camera straps. It was several hours back in Manila when we’ve had our last meal. We rode the three-hour bus trip to Tagaytay, checked in at Crosswinds Tagaytay, and did some photo ops. 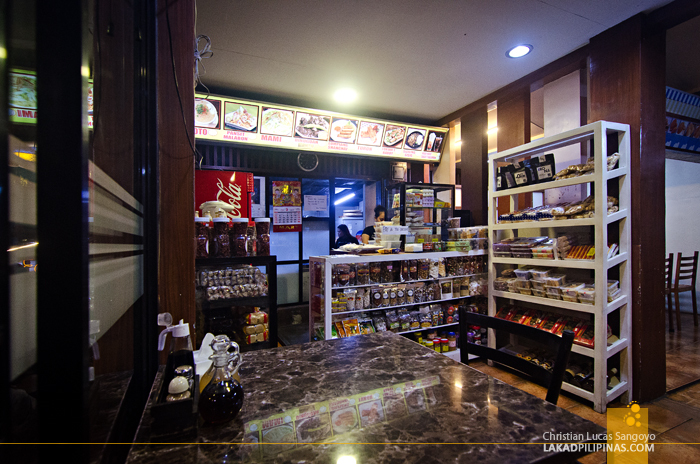 It was fully dark when we alighted from a jeep at the Magallanes Square, the happening area in the city, for some grub. It’s unbelievable that even with our level of hunger, we were still picky on where to eat. Our criteria? The budget. We’re set on having plates of longsilog and tapsilog paired with a serving of Tagaytay bulalo at Ahy Foodhouse, my favorite cheap tapsihan in the city. We were devastated to find an empty spot instead of a carinderia, the guard at the 7-Eleven told us that it has since moved to another place. Without a second option, we looked around and spotted Merienda ni Nanay. 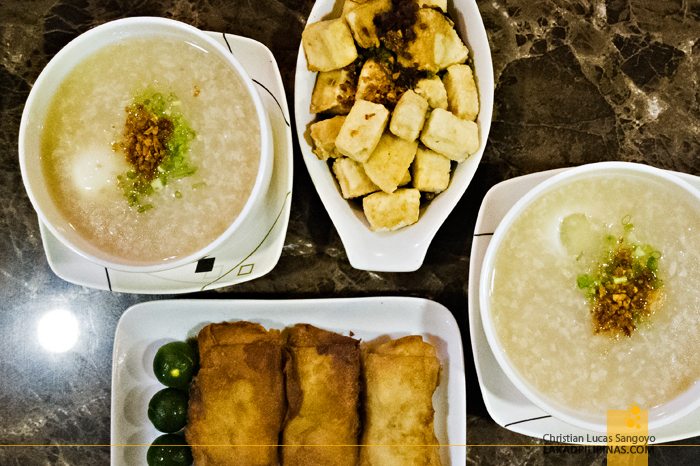 Hmmm, a hot bowl of lugaw (rice porridge), might just be the perfect dish to replace our greasy tapsi cravings. We entered the place, checked their menu, and gave each other a thumbs up. Servings were way below the hundred-peso mark. Aprroved! 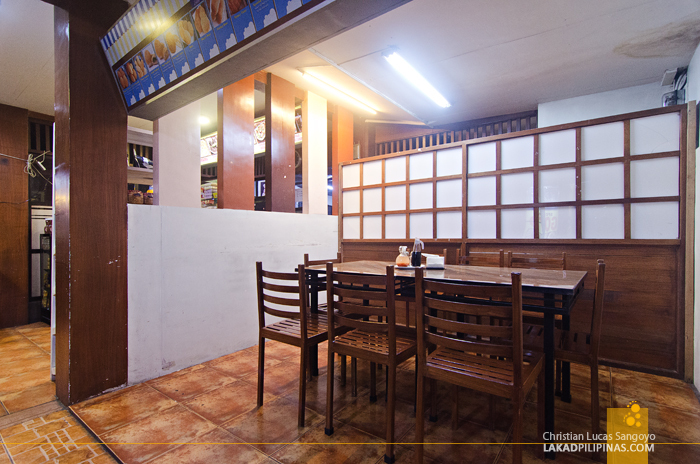 The lugawan is located right at the gate of Bali Seafood Paluto, right on the main highway. It’s a small air-conditioned shed with a balcony set with al fresco tables. 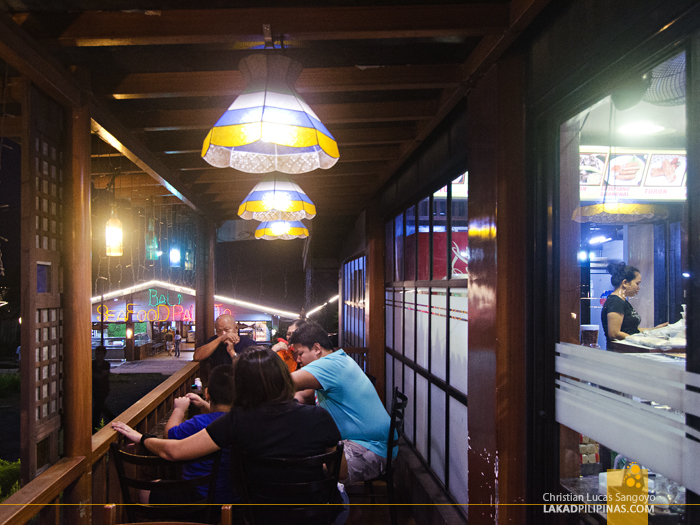 Enamored with the decorative capiz windows lining the deck, we chose the outside seats. 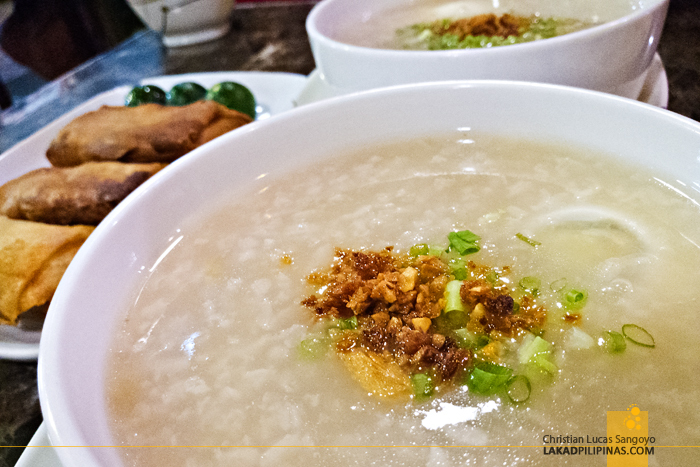 It’s definitely more enjoyable to eat lugaw with Tagaytay’s cool weather right in your face. 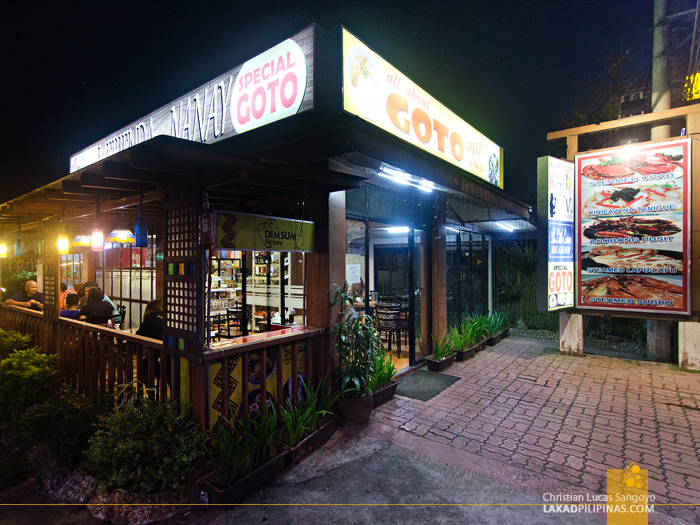 As its name suggests, Merienda ni Nanay mostly offer Filipino snacks—goto, mami, palabok, turon, halo-halo, sago, and silog meals. Even with our initial thought of having silog, we changed plans since it was priced at PHP110.00; ten pesos more than our intended budget, lol. 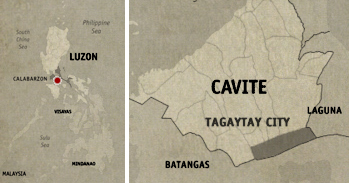 And yeah, as I kept on saying, Tagaytay’s cold weather just screams for a hot bowl of lugaw. There wasn’t much debate on what we’re having. 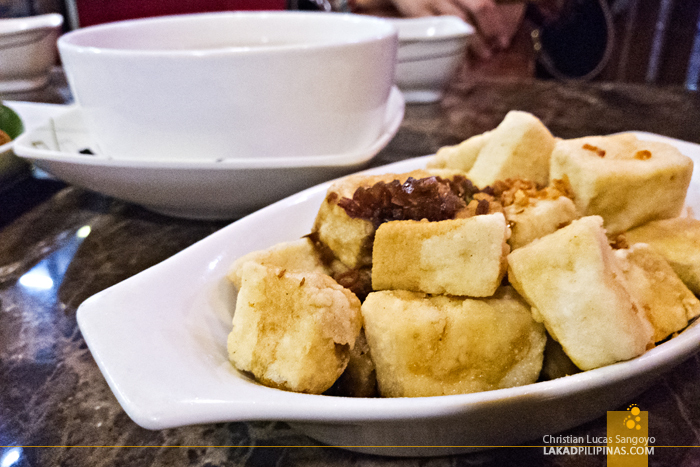 It was our standard lugawan order—two bowls of lugaw with egg, lumpiang togue (vegetable spring rolls), and tokwa (fried tofu). It totaled at PHP155.00. A bit expensive compared to your corner street lugawan, but considering its location and comparing it to Baguio’s Goto BP , it’s actually not that bad. Serving time was pretty quick, bowls of lugaw were soon steaming on our table followed by the side-dishes. The thought of posting these on Instagram was the only thing that kept us from grabbing our spoon and shoving everything down our gullet, lol. The lugaw was as superb as any lugaw and egg combo can be, the tokwa was heavenly—crisply fried shell with really soft insides—and the lumpia was crunchy, definitely freshly cooked. Even the vinegar-soy sauce was mixed just right, we added a helping of chilis for added oomph. We also bought a small bag of chicharon, crushed it, and sprinkled it all over our lugaw. Perfect. Merienda ni Nanay served everything that I was hoping for on a lugawan. Next time, I’d definitely order double helpings of their lumpia and tokwa. Haha, pang beer pa kasi! Oh lord, now I want lugaw! Been there last night at hindi naging maganda yung first time experience namin sa kanila. Imagine wala na nga sila masyado customer nakalimutan pa nila yung order namin ahaha ang saya saya diba? isang group lang naman at kami ng hubby ko yung nandun pero yung sa aming order nakalimutan pa. And take note nung i follow up ng hubby ko yung order namin, tatanungin pa ng cashier kung may order daw ba kami? nasa 15-20 minutes na kami nag aantay tapos yun ang sasabihin sayo. Nakaka HB ng bongga at wala ka man lang marinig sa kanila na humingi ng pasensya dahil sa nangyari. Kaya not recommended ko sila. Awww, sorry to hear that. They probably need to train their staff more on customer courtesy.